The megastorm that weather people have been talking about for several days has materialized, and it is already bringing very high wind and long lines of severe squalls and tornadic supercells to the Midwest and upper Tennessee Valley. Rain and thunderstorms associated with the cyclone extend as far south as the Gulf states. Blizzard conditions are expected for areas on the cold side of the storm, which is expected to bottom out its pressure in the 960 mb range. The low, centered over Minnesota as of this writing, is already at 966 mb. The factors causing this powerful system are many: Very unseasonable heat in the Southeast has led to a powerful warm sector for the cyclone, and a surge of cool air to contrast with this has caused development of a strong jet stream (>100 knots) in the upper levels of the atmosphere. Had Hurricane Richard’s remnant low been drawn more to the east, as the models were suggesting a couple of days ago, the system would have become even more powerful. A mid-latitude cyclone of this magnitude is not common. It is a credit to modern technology that our computer models were able to accurately predict this rare of a system several days in advance. The Storm Prediction Center issued a high risk for today, a rare occurrence, but with dozens of tornado warnings already called for the Midwest where the storm’s warm sector meets its area of highest vorticity advection, I expect that this will end up verifying. Since I posted last night, the range of possibilities for our coming weather in the Deep South has expanded quite a bit, and the “interesting” scenario that I hinted at towards the end is suddenly looking a lot more likely to actually unfold. I am talking about the possibility that Tropical Depression 19, now upgraded to Richard, gets into the central/east Gulf of Mexico and interacts with one of the coming troughs rather than dissipating in Mexico or extreme south Texas. 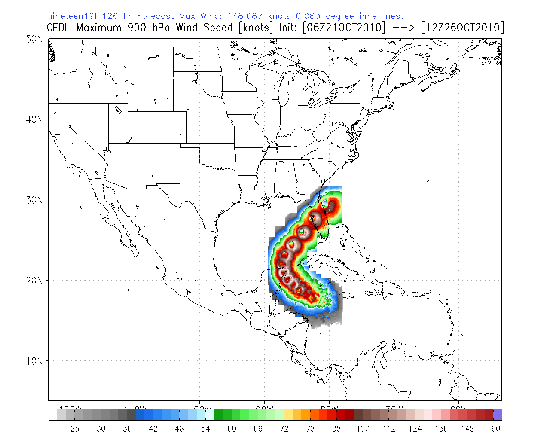 The HWRF model, which was alone last night among the well-known models in showing Richard going to the northeast, has been joined now by the GFDL, ECMWF, and the majority of other models, as this Google Earth screencap shows. The National Hurricane Center has made note of this trend as well and is expecting to move its forecast path to the east if the trends hold up. They tend to err on the side of consistency, avoiding what has been dubbed “the windshield wiper effect” when models make dramatic shifts in their forecasts. But it seems likely right now that they are already leaning in favor of an eastern track for this tropical system. The two storm-centric models, the HWRF and GFDL, turn Richard into a major hurricane and slam it into Florida, but the Google graphic indicates that there is actually quite a wide range of possible landfall locations. If the shear in the Gulf of Mexico drops off as forecast, there is really no reason why a major storm couldn’t happen (though I think there are some limits on just what is possible). Ida last year almost became a major in the Gulf in November during an El Nino autumn, after all. What about our cold-core cyclones, then? And that possible early freeze? The GFS has (and this should surprise exactly no one) backed off its screwball idea of winter precipitation for Mississippi in the first week of November. As of 06Z’s run, it was not on board with the eastern path for Richard, which throws a major wrench into matters, but let’s look at the evolution of the trough before Richard might enter the picture. If he does get into the east-central Gulf, it’s going to be about a week from now before we can consider a landfall. When the energy of a tropical cyclone is entrained into a trough, the trough benefits from it. These types of systems have spawned infamous nor’easters, such as the storm created by the transitioning Hurricane Noel in 2007. The GFS already turns the trough into a 990 mb low and possible nor’easter, and as I said, that run doesn’t even take into account the possibility of tropical-origin vorticity being advected into the dominant low. The South could very easily be in for a major flooding rain event (it is unbelievable that I could realistically use the word “flood” when we are technically in a drought), but if we have the situation of a former major hurricane being pulled into a strong autumn trough, the Northeast could get a monster storm. AccuWeather.com is well-known for hyping weather events, but I think they may be onto something with their current news story about this possible storm. Let’s just say that, while nothing is definite, the potential definitely exists. The GFS still predicts the first freeze to occur just before Halloween. This freeze would follow the second trough, which would dump even more rain on us. The freeze would be a dry freeze (in other words, a believable one) and the day following it, Halloween, would possibly not lift out of the 50s for highs. This has happened before; I distinctly recall a Halloween in the mid-90s (I am thinking 1993 or 1994) in which it did freeze overnight. After that, the cold air lifts out. As I said before, this model run has dropped the “early November Southern winter storm” foolishness of the third trough it shows. I am going to be very mindful of the evolution of Richard and the strength of the trough that the NHC and models are increasingly convinced will get it. Things are getting interesting here, folks.